Have you read the first 2 books of ‘The Portal Series’? Christian Author, Russell L. Martin is humbled by reader reviews, as the one below. He is amazed how God uses his stories to bring healing, hope and enjoyment to others. All glory to God! Take a listen to this prestigious and much treasured book review by Russell’s 8 year-old granddaughter, Olivia Allyce Breaux! Are You Going To Heaven, For Sure? Are You Going To Heaven? Do you know for sure, without a doubt? If there is ANY doubt in your heart, don’t choose to drown... Cry out to Jesus now! He hears. He answers! Have you read "Scars of My Guardian Angel" by Christian Author, Russell L. Martin yet? If not, check out the many reader reviews on Amazon at: and consider adding it to your "must read' list! Friends, have you read “Scars of My Guardian Angel” by Christian Author, Russell L. Martin yet? If not, check out the many reader reviews on Amazon at: and consider adding it to your ‘must read’ list! 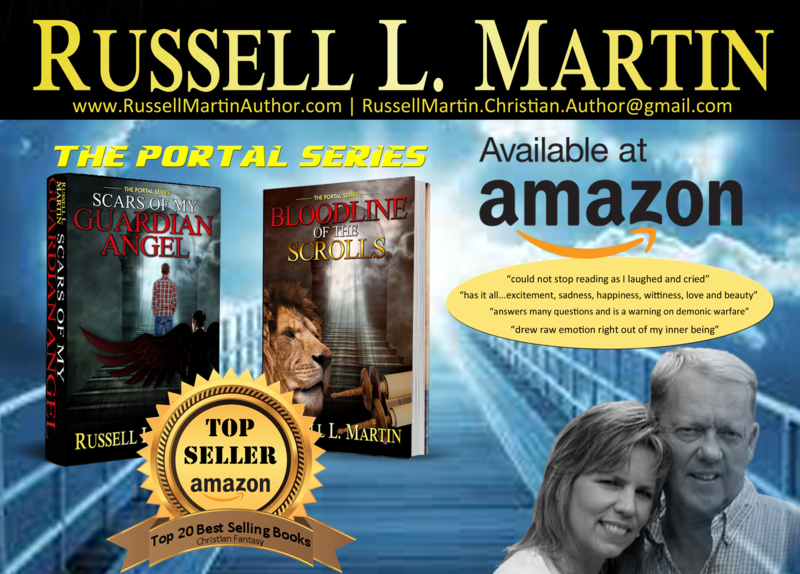 Visit Russell L Martin Author's profile on Pinterest. Russell L. Martin, known to his family and friends as Rusty, was born and raised in Grant Parish, located in central Louisiana. His family lived near the poverty level throughout his childhood. With a limited education and a strong desire for a better life, he hired out with a traveling construction company that installed oil and gas pipelines all across the U.S.A. Starting out at the bottom of the food chain, working as a laborer with little to no money, he would camp out near creeks and rivers to survive the high cost of living away from home. When his strong work ethics became noticed by his supervisors, he was allowed to advance and work in all phases of the oil and gas industry. After several years of working on land, Rusty decided that it was time to get a taste of installing pipelines in the Gulf of Mexico. To further his education in this part of the industry, he received commercial diving degrees at The Ocean Corporation in Houston, TX. After only a couple years working in the Gulf as a diver he went back to land-lay operations, due to a family crisis. He continued working freelance for multiple pipeline companies, until finally retiring after 34 years in the oil and gas industry. It was not until he decided to settle back down where his roots of life started in central Louisiana, that he finally surrendered to becoming an author. His love for God, paired with many strange events throughout his life, left him with a gift of telling amazing stories. He has stated, and truly believes, God led him to the keyboard of his old work laptop. Surprising his family and friends, he unveiled a hidden talent that no one realized he possessed, including himself. Rusty has also written 13 wonderful Christian songs, that he and his wife share in local churches around their community. Playing his Taylor guitar and singing Christian music is truly a deep passion of his heart. He and his wife, Laura, live a humble and quiet life on a few acres nestled in the middle of Kisatchie National Forest. They enjoy life with their two horses, Ellie Mae and Hollywood. This couple also loves two stray dogs they rescued out of the deep woods. The one they call Daisy May looks like she might be a redbone hound, and the other one, Nibbles, well he’s just a dog.